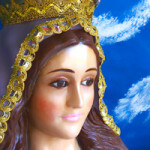 Mother Mary appeared in a splendorous light at the grotto at the house of the Visionary Valerie, in the 4th Joyful Mystery, the 8th Hail Mary and She remained for 9min. Mother Mary’s rays were shining on the world which is filled with darkness and there are many problems day by day. My children, through this apparition in Aruba you learn a lot about how to grow spiritually and you get to know the Catholic religion better. Many of you understand this very well, others have an average understanding of it, while others don’t understand anything at all. First you must learn to forgive and forget, learn to pray the Holy Rosary, to pray within the family and go to Mass, know the Holy Sacrament and go to adoration together as a family, because a family that prays together stays together. You also get to know Me and My Son Jesus more for your lives to go well and you get to know the Holy Spirit so you can receive different divine gifts so you can go forward. Those who have faith move more to go forward in life. All of you in the world will receive a call for conversion before it’s too late and work for Me and My Son Jesus. My children did you start helping others with clothing and food, and praying for them? All of you need to the Word of God so you can evangelize others so they can become religious and chosen spiritual children. It’s never too late to listen. Don’t let your ears remain covered, because now more than ever you must listen to what I and My Son Jesus have brought for you to know, because there’s more hate than love and more war than peace. There’s no one help you like in the past. In the past you would all receive help from a brother, but now everything is materialism, revolt and readiness to fight with whomever. Many think first before helping with anything. Before you were ready to help without thinking too much. Do good deeds and don’t say no. Faith without deeds is dead, it doesn’t have life. My children, I’ve been crying all these days, crying for you, for what is coming for you. There’s a lot of darkness and bad spirits pursue you, that is why you must wear religious articles. With time everything will change and there will be pains, blood and death. Many innocent people will die. Also, a very known and important person for the world will die. Many of you were not expecting this. Nothing is impossible. Trust in the love and mercy of My Only Son Jesus. Share more prayers with one another. Now is the moment for you to only pray with profoundness from your heart. Remember and never forget what I speak to you about. I come 4 times in a month to My Visionary to prepare you for what is coming – it’s very close and it’s serious. Already, all who have died and who are in the Celestial Glory are praying for you, because My Son Jesus has already spoken to them and told them what is going to happen with the world and close to you. My children take time to convert and Heaven’s door will open to surely receive you one day. Your Mother, the Virgin of Grace of Aruba, who loves you forever. Thank your for listening to My message.